I have been living on campus for four months now. If there is one thing I can promise, it’s that there is always something to do! I’m at Creighton University, but I’m sure that what I am going to tell you can be applied to any university in the United States. I am in touch with other friends who are spread out around the United States and we’ve discussed similarities between all of our campuses. Campuses are like little towns. They offer any service you would need - restaurants, shops, libraries, gym, post offices, churches, campus police and more. Generally, you can benefit from all of these services so take some time to get informed about what’s available to you. At my host university, for instance, I’m allowed to receive a dining plan of my choice. I chose to get nine meals per week plus dining dollars. That means that I can go to the dining hall nine times in a week, plus I have money that I can spend on food and other essential goods in any store and restaurant on campus. As a full time student, I am allowed to enter the gym for free for the whole semester. It doesn’t even matter that I am an international student. I can use any kind of equipment, the courts and the track. It’s all free! I did pay $25 to join the extra fitness classes. I think it’s very interesting that we are encouraged to do some activity. Also, I can meet new friends! Universities also organize events for students, and some of them are free. I participated in different events, such as international get-togethers, a Hawaiian party and a Flo Rida concert! American universities care about their students and they want us to feel at home and make new friends. Pay attention as you walk around campus to see events postings and always check your email, where you will often find news of events or opportunities. 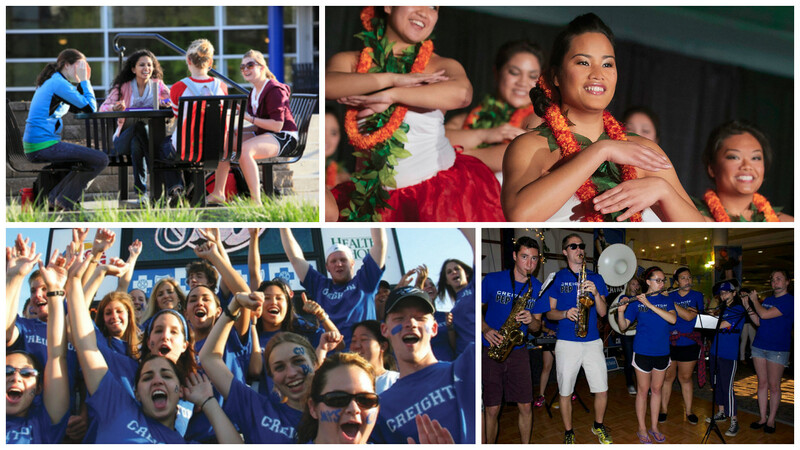 In my opinion, the most important part of campus life is joining clubs and associations. There are sport, religious, cultural, political and academic clubs, and clubs just for fun. There are also American fraternities and sororities, but you have to pay to join them, and registration fees are not cheap. Otherwise, there are lots of free clubs and organizations you can get involved in. I’m in the Rock Climbing Club and I’m really happy to be part of it. We meet once or twice a week and we spend a few hours in the gym helping each other. It is a great opportunity for me because I continue to meet new people, I have the chance to do what I like and it is also a way to release stress and fight against homesickness! I promise you’ll love life on campus!